I’ve been keeping a secret from y’all and I just can’t live with it anymore. I have a miracle stain remover recipe that has time and again proven to work on some of the most stubborn stains. Recently, Pretty Handsome Guy came back from a business trip with a stained button down shirt. It had wing sauce on it AND it had been allowed to settle for a few days AND he hadn’t pre-soaked it or used any stain remover. (Have I not taught him anything?! Sigh.) I thought for sure the shirt was a goner. But, I decided to put my miracle stain remover recipe to the test. Low and behold after 24 hours of soaking in the concoction, the stain was magically gone! No scrubbing, it was simply gone. Can I apply for a magic wand now? I can’t lay claim to the recipe. I found it on a local “Mommy” message board back when I was a new mom. But, this recipe has worked on more stains than I can count. Fill your basin with warm water then add the oxi-clean, clorox 2 and dish detergent. Give it a swirl and mix until the powders dissolve and bubbles form. Place the stained garment into the mixture, being sure the stain is submerged. After two hours you can take a peek! My stain was gone. For tougher stains, let it soak overnight. Remove the clothing to behold the miracle! Normally I will throw the garment into the wash, but you could simply rinse and dry it. And, this formula is also safe for colors as well! In the spirit of sharing, I also came across this recipe for laundry detergent from Busy-at-Home. It is so stinkin’ inexpensive, you won’t believe how much it costs to make. But first, have you seen the price of laundry detergent lately?! 150 oz. for “gulp” $21! Whereas the recipe I made yielded 250 oz. for….are you ready for this…$0.61! Yup, if you don’t believe me, you can see Busy-at-Home’s calculations. She figured out she would save 97% on detergent by making her own. And the best news is that it is safe for HE washers. You only need 1/4 cup per load. The recipe was derived from Michelle Duggar’s own laundry room. I’ve used the detergent for a few weeks (and a dozen loads) so far. It works great. The only thing I miss is the linen scent of the detergent I was using. But, for 3/100th of the cost I can deal!!! And since I’m talking laundry today, this post wouldn’t be complete without mentioning my secret weapon for drying clothes. They look like medieval torture devices, but these little blue guys have completely kicked our fabric softener sheets to the curb! I haven’t used them in over 4 years now! At first I was concerned about static (the bane of my hair’s existence), but then a friend told me that you can eliminate static by not letting your clothes over dry. Simply shut off the dryer when your clothes are about 95% dry. Don’t let the dryer run and run and run until the clothes are piping hot and there isn’t a spot of dampness on them. Instead, let the moisture sensor (if you have one) do its job and it should shut off right before the clothes are dry. The waist bands in jeans or sweatpants may feel slightly damp, but everything else feels dry. And most importantly, pull out fleece, polyester, and synthetic clothes about half way through the cycle. The dryer balls (you should use two) work together to punch, separate, fluff and dry your clothes. They also help keep wrinkles to a minimum, but I’m not afraid of a few wrinkles (see my no iron solution to wrinkles post.) The Nellie’s Dryer Balls cost $16.99, but the cost savings of not using dryer sheets is definitely worth it. 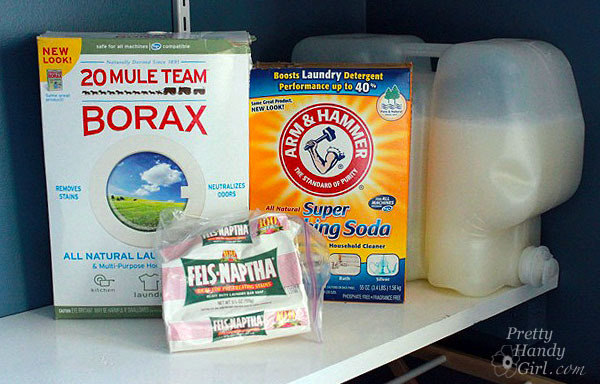 Plus, you don’t have to stress about the chemicals that are in dryer sheets. These little wonder balls (I can’t believe I just typed that) last forever! I have been using mine for over four years. They start to get darker on the nubs from dye in your clothing, but it doesn’t transfer and it doesn’t hurt their effectiveness. That’s all for today. I’m taking off my June Cleaver outfit now and returning to my normal Bob Vila attire. Disclosure: No disclosure necessary today. I was not paid to write about any of these products and none of them were sent to me for free. These are all products that I use and love! I use this exact recipe for the homemade laundry soap and have for a couple of years now and I LOVE it! I add a bottle or 2 of the Purex crystals to my recipe and it smells awesome! Add Purex crystals to your detergent recipe to get a lovely smell! the homemade laundry detergent doesnt work on uniforms and heavily soiled clothing, its good for linens and such you dont mind some stains on. i used that recipe for 4 years, to no avail, and had to switch to Arm & Hammer pods, with the Purex Color safe bleach. the homemade laundry detergent is good if you cant afford regular detergent, or you are out in the middle of nowhere and need something you can make yourself to last. no amount of soaking helped either. HELP! I forgot I left oxiclean stain remover on a white toddler romper and the remover has dried 🙁 It was on too long and now romper has a huge yellow stain on it. I already tried washing in washing machine twice, once with oxyclean detergent, and the second time with just distilled vinegar. I also soaked it overnight in the sink with 2 dissolved denture tablets. The yellow has fainted slightly but it is still there. Did I remove the whitening agent in the romper? Note the romper has a pink trim on it, so I’m worried about fading that color. Can I try to spot treat it with bleach to whiten it again (by using a toothbrush and avoiding the pink trim)??? Any help would be greatly appreciated!!! How do you deal with oil stains? I’ve always wondered how those little knobbly balls helped with the laundry! Thanks for the awesome tutorial, it’s certainly a great way to make the most of household products! I just stumbled on this a few weeks ago, and I want to say that your magic stain remover is the only thing that has worked on my clothes. I had an off-white sweater with a giant coffee stain in it that had been washed and dried four times before I noticed, and after using your trick, not only did the stain completely go away, but I found out the sweater was actually supposed to be white! It’s so bright now! My white sheets were grey from incorrectly washing them over and over again. I tried White Brite, bleach… nothing worked. Soaked them for 2 days using your trick, and they are shining now! Yippee! So glad it worked for you. Yes, this formula is amazing! That’s a great tip Mike! Thanks for sharing. The link for the laundry detergent is inactive. There’s no longer a blog by that name, busy-at-home. Can you please share the exact proportions of the three ingredients? Thank you so much! This is much simpler than the recipe I’m currently using.